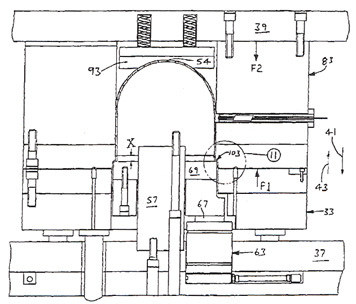 Two employees of Miller Tool & Die received a United States Patent for their advancement of a tool and die making process. This process has helped many of Millers clients eliminate costly steps, down-time and frustrations. Miller is proud to have these inventors in house. These innovations help our customers with numerous tooling needs. In July of 2007, Keith Nagel and Rob Riehbrandt of Miller Tool and Die received a United States Patent ( 7,237,423 B1 ) . The patent is for a traveling step ledge that applies side wall stretch to a deep drawn part. Stretching the side walls puts a "set" to the drawn shell. Once trimmed the part will have minimal springing. If this is an application that fits your needs, please contact us for a review of your component. A blank is stretch formed into a formed piece by bending the blank over a stationary punch. A draw ring has a step that cooperates with a pad ledge to create a step-ledge. The blank is bent with a reverse bend at the step-ledge. Subsequently, the step-ledge travels a short distance relative to the punch to stretch the blank material. Step-ledge travel is achieved by pre-charged cylinders that travel slightly in response to a force exerted on the draw ring and step-ledge by the press ram after the blank is bent into the reverse bend. The formed piece is cut along a plane through a wall thereof to make a finished piece. The finished piece free edge remains stable and in the same position as when in the press. Consequently, the free edge can be readily aligned with and welded to the free edge of a second finished piece. Contact us today to find out how Miller Tool & Die can help.